My current album is mostly photos of my mom and her family from the 1940s. Back when my mom was alive a cousin said that he was doing digital photo restoration, but she “heard” (and I am pretty sure I know from whom she “heard” this) that converting to digital is a waste of time. Then she gave me the spiel about how because of technology, we wouldn’t be able to access digital photos forever, but anyone with eyes can see printed photographs forever. I offered to do the scanning so that she could just send the disk to the cousin. And I actually got a start on the project. I got two photograph albums in (those photos are on a different external drive than the one I have attached to my computer right now) when everything sort of fell apart. My mom died and my marriage ended. My now-ex also took the scanner, since it was technically his. As a result, stopped scanning the photos. The album that I am on now was my next one up and I really wish I had done this album first or second, because if my mom had seen the shape of some of these photos, she would have agreed wholeheartedly with scanning them in. A number of these photos are faded almost beyond recognition, and some are actually falling apart. In an ideal universe, perhaps leaving the prints alone would work. But right now, when these photos are 70 years old, I am thrilled to be able to preserve them as they are. And I know that technology will change, but one of the sources I found says that the life expectancy of an “unmanaged” collection of digital photos (by “unmanaged” they mean that no one is there to port them over to new technology) is 20 years. I fully hope to be here longer than that. If all goes as planned, I have at least 30 to go and am doing my best to make it another 50. I have too much traveling to do to die in the next 20 years. Just in case, however, I have asked my son to donate a hard drive with all of this work on it to a library or archive after my death. If I am not here to manage my photos, then an organization that exists to preserve memories can do it for me. 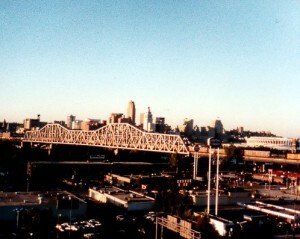 Cincinnati, August 1987, taken from across the Ohio River, in Covington, Kentucky. I made my first trip to New York City as part of a family vacation in 1988. There is a whole backstory to that, which I will tell as part of my travel memories at a later date. While my parents and I were, I think, walking from our hotel to the United Nations Headquarters, we took the walkway along the Park Avenue Viaduct through the Helmsley Building. When we came out the other side, I realized that we were close to Grand Central Terminal. I asked my folks if we could walk the couple hundred feet to Grand Central so that I could see it, but they didn’t want to go out of our way, so I didn’t get to see the station on that trip. I have divided my travel into two eras: Before 1977 and Starting with 1977. The Before 1977 era is the era when my family and I traveled pretty much exclusively to South Florida and North Carolina, nearly always by car, rather than by plane. Even though we started traveling other places starting with 1977, I still have traveled between my home and South Florida many times since then. Four of these trips were by car, and the others were by plane. My son and I had a fantastic (and exhausting!) time on our trip. My travel tends to be jam-packed with activity. With the exception of Saturday, when we went to visit some friends in Philadelphia, we did at least two things every day of our trip. We also walked, on average, 11 miles every day. It was amazing, and fun, and I got both a lot of exercise and quite a bit of sun (and yet my skin is still the same color it was when I left). I hope my son learned a thing or two while we were out there in the big city, as well. Over the next few weeks I will be talking some about our destinations, of course. I will also be sharing some information on how we got from one place to another as well. But for now, I am exhausted and I have to get back to work tomorrow, so I’ll be saying good-night for now.